To obtain an age related number and V5 registration document Derived from factory records. Confirms the year and model of the frame, engine and gearbox numbers provided. Includes letter detailing any other factory data e.g. supplying dealer Certificate valid with DVLA for 1 year ONLY. A new certificate is required after 1 year. Bike must be roadworthy, MOT’d (if applicable) and insured. 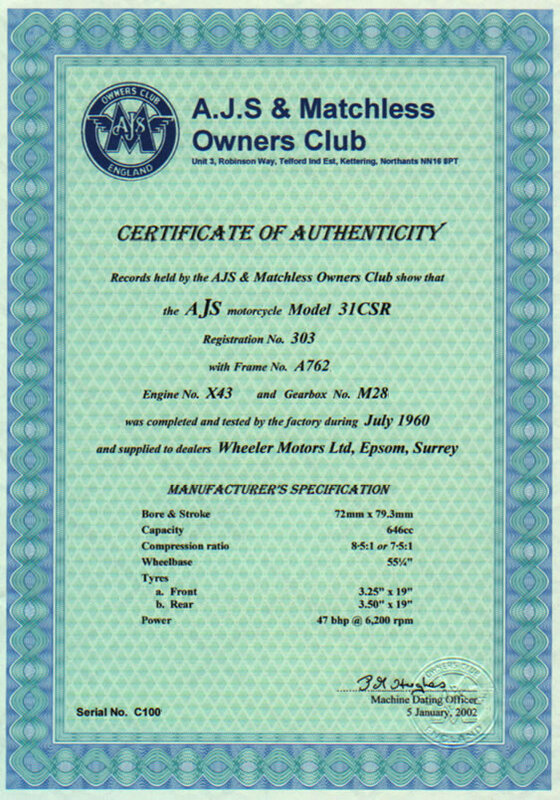 Information useful pre sale, pre purchase or before a rebuild On line at dating.ajs-matchless.com for a range of years and models Cannot be used for DVLA purposes. Factory records for some years are patchy. The centralisation of services at Swansea has meant that new policies and procedures have had to be considered. This document sets out the new procedures for services previously provided by Local Offices in respect of the registration and licensing of historic vehicles. Currently at Local Offices, customers can have original documents such as old log books, copied and verified and submit these verified copies with their V765 application. As a result of centralisation, DVLA has carefully considered the impacts of posting original valuable and historical documents to Swansea for processing. Any club listed on the V765/1 "List of vehicle owners' clubs" will be able to photocopy and verify original old documents that support a V765 application. The copies must be annotated "authenticated copy" and be stamped, signed and dated by the V765 club signatory (preferably on the front of the document) taking care not to obscure any vehicle details. The authenticated copies should be submitted with a stamped and approved V765 application. In line with current procedures for authorising V765 application, applicants/signatories cannot verify their own documentation. Where there is evidence that documentation is being falsely verified by an owners' club, they will be immediately suspended and possibly removed from the V765/1 authorised list. From 21st October 2014, applicants will be unable to make an application for a tax disc in conjunction with a V765 application. In addition, for applications made via the V765 scheme, vehicles will no longer be put into the `not licensed' tax class. When a V765 application is received and successfully processed, the keeper will be issued with a Vehicle Registration Certificate (V5C) showing the tax class as `historic' or `private light goods' (whichever is applicable). When the applicant wishes to tax the vehicle, this can be done at a tax disc issuing Post Office®, in the usual way using this V5C. The vehicle will only fall within the scope of Continuous Registration (CR), Continuous Insurance Enforcement (CIE) penalties, or Statutory Off Road Notification (SORN), after the first tax disc has been issued. The vehicle must not be used or kept on a public road without a tax disc. New Applications must be supported by acceptable documentary evidence as above, recent photographs, and the relevant DVLA Forms V765 and V55/5, together with the Club fee of £30 payable AMOC Dating. All machines will be inspected on behalf of the Club and must be in a complete, assembled condition. It is always advisable to ascertain from the DVLC that your registration number is not currently on their computer, as this will save you going through the whole application process only to perhaps find that the number has been re-issued, with the only recourse than being to apply for an age-related number. The DVLA Enquiry Unit telephone number is 0844 496 0602. Please note that the final decision on acceptance of all applications rests with the DVLA and, if rejected, the Club's fee is not refundable. Online search of our factory records to find basic information on a frame number. This online service allows you to enter a frame number and immediately see if there are any factory records within our system for this frame. If we find any matching details, you can see the year of manufacture, make and model of the bike as it left the factory. The fee for this service is £10 (£5 for club members) and the results are shown to you immediately on screen. Note, if you require more information than this simple search, you should use the Dating Letter or the Certificate of Authenticity option described below. Click here to use this service at http://dating.ajs-matchless.com. Send clear, close-up photographs of both the frame & engine numbers, together with details of the gearbox number to the Machine Dating Officer, who will corroborate these and issue a Dating Certificate. The cost of this service is £10.00 to club Members and £70.00 to non-Members (cheque made payable to AMOC Dating). For your own information, wherever possible, a covering note will be enclosed giving further information gleaned during the search of our records. To obtain an age-related number once you have your dating certificate, you must contact the DVLA at Swansea to obtain a V55/5 who will require not only the verified Club Dating Certificate but the completed V55/5 Form. The vehicle must be a complete, assembled machine, with a current MoT Certificate, (these can be issued on the frame number by the Testing Station) and Certificate of Insurance. Vehicles manufactured before 1 January 1960 are exempt from the requirements to have a mandatory MoT test. If satisfied, the DVLA will then issue a number, based on the marque of the frame, and arrange for a V5C to be issued. Where the age of the frame and engine differ, the DVLA now class this as a reconstructed classic, and the "age-related" number will be based on the age of the younger component. Following the Budget in 1998 the Government introduced a fee for all "first" registrations (currently £55.00), payable to the DVLA. The Machine Dating Service also provides the following services, and it may help members if we explain the subtle differences. The fee in each case is £10.00 to Club Members and £70.00 to non-members. Photos of frame, engine and gearbox numbers must be provided. DATING LETTERS to assist with identification of miscellaneous frame, engine and gearbox numbers. Before commencing a 'rebuild' it is advisable to have the frame number checked to ascertain the correct marque, i.e. AJS or Matchless. Members may also wish to use this service to check validity when purchasing a machine. Please note that all queries of a technical nature should be made via the Technical Helpline. CERTIFICATES OF AUTHENTICITY - detailing frame, engine, gearbox and registration number, together with Manufacturer's Specifications. Of A4 size and embossed with the Club seal, signed and individually numbered, these look great framed and hanging on the wall of your favourite room. Typically designed for 'all original' machines with the frame/engine/gearbox numbers that match the factory record, the fee for this service is £10.00 to Club Members and £70.00 to non-members. When writing, please include a stamped, self addressed envelope with your request. Please also include a contact phone number and make cheques payable to "AMOC Dating". An example of a certificate can be seen here. All information is supplied from the original factory dispatch records. You can contact the clubs Machine Dating Officer at .